NOTE: THIS IS AN MLB ONLY ROSTER! NOTE 2: I've replaced the player IDs for those who don't have any kind of an accurate portrait with the default team portraits I had made previously. I took those down but reposted them (portraits downloads section). You may want to install them. If portraits are made for any of these players, ID nos. can always be easily changed back. Great thanks to Laroquece for keeping up with roster moves throughout the year (you have no idea how much time that saved me as the roster moves and changes were especially tedious this year)! Also, thanks to Ballfour who made some great generic upgrades for us in the facial hair department. A great little touch that brings a little more realism to the game! 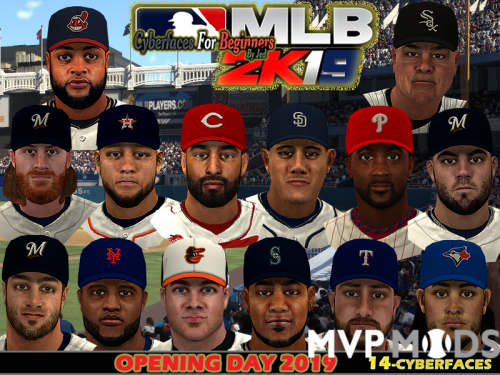 This roster is a culmination of all of the updates done throughout the year including defensive ratings, batting ratings, pitcher styles, types, speed and trajectories, hot/cold zones, player speeds, etc. Many newer players added/created as best as possible. This may be the most complete roster update I've done. Start of season will include players who were expected to be on the Opening Day roster had they not been placed on a short injured reserved list. Players on longer IRLs should still be in the organization (e.g., Scooter Gennett, etc.). Rosters have been tested and sim the season successfully as well as in-game play. If you find any mistakes (batting stances, pitching styles, jersey numbers, etc. ), please PM me and I'll include the fixes, if warranted, in the next update, or if there are enough I'll upload another version. If there are a multitude of moves between this release date and 3/28/19, I'll publish an addendum update. Since "Placeholder" players (last name) were put in to fill the empty slots, these rosters can be used with injuries and suspensions set to "ON" without crashing. Most every team has 24-25 players. If you want to use these rosters to create another version or a roster incorporating MiLB, just ask (as someone already has in reference to a standard only roster). If you are thinking of making a MiLB roster set, you can alter the existing "Placeholder" players. 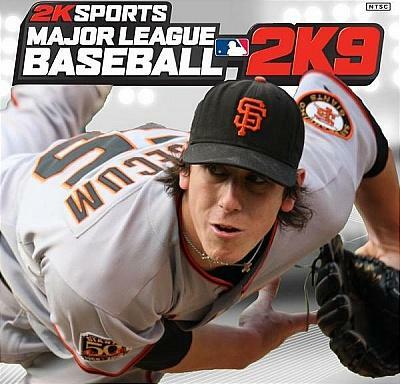 INSTALLATION: Go to C:\Program Files (x86)\EA SPORTS\MVP 2005 (or whatever you named it)\data\database subfolder. DELETE the existing 19 .dat files. Unzip this roster file to that location. DO NOT SIMPLY OVERWRITE! **If you're going to give feedback, please make it intelligent. If you don't know what you're doing or you're one of the only few who is having trouble, then don't leave me negative feedback. Ask questions in the comments area or PM me!! Thanks. This is an end of the season roster. 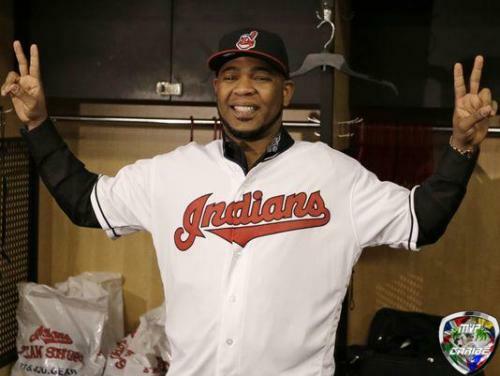 Like past versions, it will typically incorporate players who have given the most service to their respective organization with a few exceptions (e.g., overall playing time during the year such as innings pitched and plate appearances, a more notable name will bump out a lesser name, a pitcher who seemed to be a pure #6 starter will be kept off, etc.). Typically if you think a player should be on the MLB squad, he will most likely be in the organization at some level. Simply substitute him for someone you think should not be there. Several players not previously created, especially pitchers, were included in this version. Some teams were difficult to keep certain players off the MLB level. A few teams will have 13 players on the pitching staff, but most will have 12. **I will not be doing All-Star teams. The game has too many limitations and it's simply not worth the time. Sorry. Please PM me for any changes needed or place in the comments, not review. 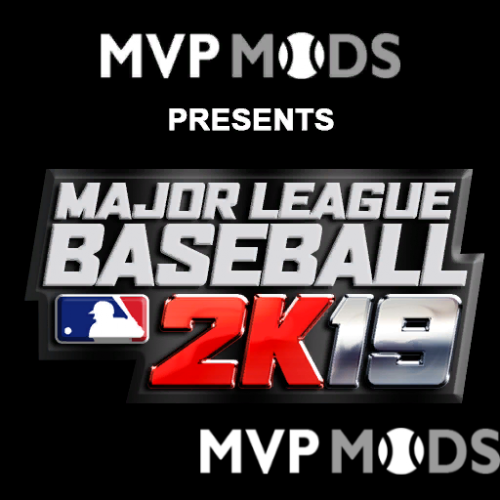 I will be doing a version 2, which will address major player attribute tweaks such as pitch control and batting contact/power. I may look at speed again as well. Since "Placeholder" players (last name) were put in to fill the empty slots, these rosters can be used with injuries and suspensions set to "ON" without crashing. Most every team has 23-25 players. **If you're going to give feedback, please make it intelligent. If the rosters are not working for you, then don't leave feedback and rate the rosters down simply because you don't know what you're doing. Ask for help! **Also, don't just be a leech around here! .... give feedback to ALL modders from whom you download files. Make comments. Give suggestions. Please PM me for any changes needed. I'll most likely be tweaking this over the next few days. This is more reflective of an Opening Day roster set as compared to last year. There are a few exceptions as some teams are only indicating 4 starters and the MVP game demands 5 (with the Giants being the most difficult). A good number of relievers especially had to be created. For those debuting in the MLB this year, I had to rely on scouting reports which are not always the greatest. Other major change since the last tweaks include pitchers who either do not feature a 4 seam fastball or throw one at all had the control for that pitch pushed down to 10. Line-ups are set per the RosterResource site. Of course guesses about DH for NL teams and no DH lineups for AL teams had to be made. If you find any mistakes (batting stances, pitching styles, jersey numbers, etc. ), please PM me and I'll include the fixes, if warranted, in the next update, or if there are enough I'll upload another version. Manager cyberface nos. may not be complete/correct, especially for Tampa Bay. **If you're going to give feedback, please make it intelligent. Thanks. NOTE: THIS IS AN MLB ONLY ROSTER!!! This roster incorporates changes/edits made at the end of last season. Additionally, fielders speed edits are now better integrated thanks to MLB stats being tabulated for baserunning speed. Some players had to be adjusted accordingly (e.g., Altuve). Not all new players have been created as of yet as they are uncertain for the start of the season. Moves include up to today (Lucas Duda to KC). This will be the only Spring Training roster. Once again, there will be NO creation or organization for the minor leagues as it is just too time consuming. So when you leave feedback, leave it wisely. If you leave feedback about why the minor leagues are not accurate, I will promptly show up at your door and smackeral you Monty Python style! Rosters primarily reflect players on the roster at the end of the season who have largely given the most service to the MLB squad to date. 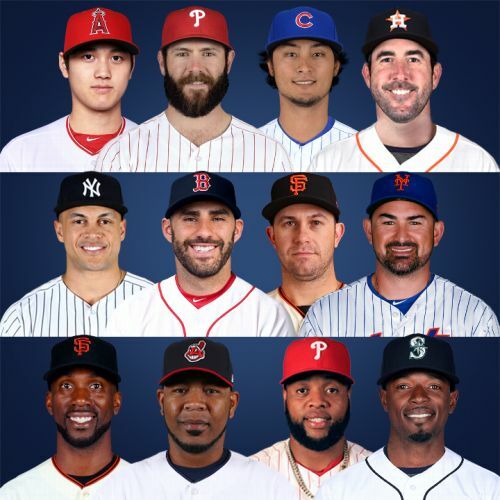 There are some exceptions when it comes to some marquee players, but I do take into consideration the total amount of playing time, especially with pitchers. However, some players get caught during a trade and I couldn't justify putting them up on the MLB roster over another player. 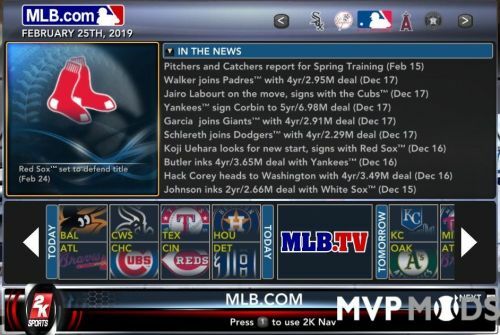 If you do think that a certain player deserves to be on the MLB squad over another, you can simply move him within the game itself or one of the editors. 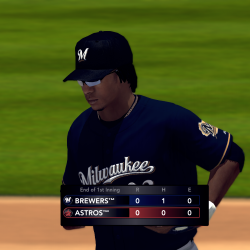 I made sure each team had 12 pitchers and 13 fielders. Phase 1: These are primarily setting the rosters only. A few pitchers had to be created that I had missed previously and very few fielders' batting numbers were adjusted. I have NOT included some of the latest cyberface numbers, though you can easily correct this again with one of the editors or doing it directly in the attrib.dat file (as previously discussed in the forums). **Batting adjustments for power and contact for all fielders completed. **Starting pitching rotations adjusted to largely match RotoWorld. **Secondary pitches velocity reduced by 3 mph (except for 2 seam FB). **Recent cyberface ID changes integrated. **Updated batting contact/power ratings for pitchers with 100+ PA over past 5 years. **Pat Neshek moved up to the Rockies bullpen. If you notice any correction needs, please PM me. However, please do not PM me about minor league players. INSTALLATION: place this rar file into the database subfolder (where your 19 .dat files are). DELETE the existing 19 .dat files first. Then, unzip/rar this file to this location. DO NOT SIMPLY DO AN OVERWRITE!! **If you're going to give feedback, please make it intelligent. THIS WOULD INCLUDE IF YOU DO NOT KNOW WHAT YOU'RE DOING. Leave a comment or question in the comments area if you need assistance, not in the feedback area. Thanks. 2017 BaseUp! End of Season Rosters ~ PC vs PC! NOTE: THIS IS AN MLB ONLY ROSTER FOR PC VS PC PLAY ONLY! Rosters are adjusted for PC vs PC play only. If you attempt to play vs. the PC you may not get the same results. NOTE: The ratings for the main batting attributes (contact & power) are purposely lowered to play effectively like this. Do not contact me about this. NOTE 2: You can load these rosters, then save in game, then re-install other preferred rosters. If you do this, you'll have to then load your save to play PC vs. PC. Rosters include the trade deadline transactions and relevant call-ups/send downs. Necessary new pitchers created. New minor league affiliation names and moves completed. 2017 All Star teams added. 9 pitchers who appeared for each team included. Certain members not included due to the 25 man limitation. Note: rosters do not reflect this actual date as they may have players who are still currently on 10 day DL lists, etc. If you notice any correction needs, please PM me. Rosters include transactions and relevant call-ups/send downs. Significant no. of pitchers' edits, especially relievers who have been brought up. Batting edits done to some rookie position players. **If you're going to give feedback, please make it intelligent. THIS WOULD INCLUDE IF YOU DO NOT KNOW WHAT YOU'RE DOING. Leave a comment or question in the comments area, not in the feedback area. Thanks. Rosters include transactions and relevant call-ups/send downs. Significant no. of pitchers edits, especially relievers who have been brought up. Rosters include moves and relevant call-ups/send downs. 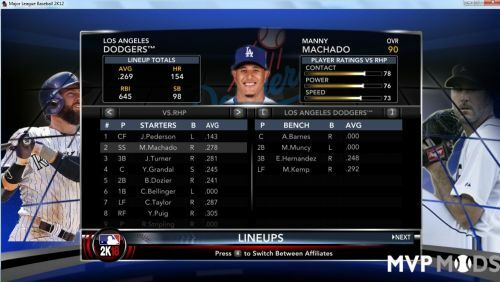 Updates made to many rookie and young fielders' hitting attributes. This is NOT an opening day roster set, as indicated in the announcement thread. This is a start of the season roster. This means that most every team will include players on the short DL stints. That being said there can be oversights. Also, I'm sure not every line-up is picture perfect. Adjust the line-ups to your liking, especially for inter-league play. Tweaks that were included in the pre-season roster are here. A few players (fielders and pitchers) were tweaked additionally. Primary additions for this roster are rookies who had very limited or no MLB action last year. 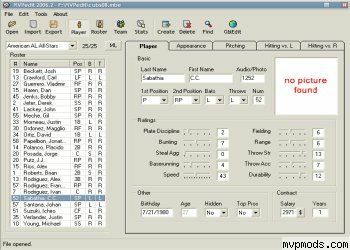 Pitchers who had no experience will have fairly generic pitching profiles until some data comes in. Sidearm type pitchers were better identified. If you find any mistakes (batting stances, pitching styles, jersey numbers, etc. ), please PM me and I'll include the fixes, if warranted, in the next update. Since "placeholder" players were put in to fill the empty slots, these rosters can be used with injuries and suspensions on without crashing. If you want to use these rosters to create another version, just ask (as someone already has in reference to a standard only roster). Pre-season MLB roster to date for 2017. There are a few LRP's for which I have no data at release of this roster set. 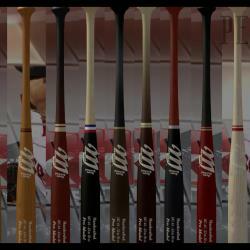 THESE ARE FOR MLB ONLY! This is not a minor leagues roster. This is why you will see many players name "Placeholder" because that's exactly what they are....place holders. However, all teams do have 25 players and therefore you should be able to turn on injuries and suspensions without crashing. I have adjusted pitchers during this past off season so that most pitchers do not have 3+ strong pitches. Also, a good number of speedsters were brought down a bit in speed. If anyone see any jersey numbers, batting stances or pitching styles that are incorrect, PM me with changes needed and suggestions. hola amigos este es el roster actualizado de MLB 2017 hasta la fecha de ayer 23 de enero 2017.. anteriormente habia enviado un roster pero fue un error mio lo coloque con otro formato que no es el adecuado.. cualquier jugador que falte o no este en su respectivo equipo me avisan y lo modifico.. tambien estoy trabajando con los portrait respectivo con estos ultimos cambios... PRIMERA VEZ que estoy colaborando con el equipo de MVP Caribe.. saludos hermanos. Hello All I have completed my overhaul of Roy's Rosters for the Awesome NCAA 16 Mod. Every team is edited along with the 2016 Final Team records. I have also created a generic schedule using Roy's team settings so ENJOY!! Thanks to Roy, Dennisjames and all else who worked on this Project! This file is for WATCHING PC versus PC games, not playing. 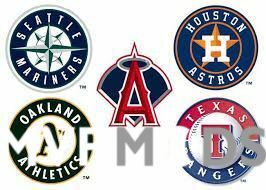 This features modifications to the 8 2016 MLB playoff teams. Simply set the matchup that you want for a given game in the "Season Prep" mode and choose MVP levels for both teams. Use the recommended sliders in the appropriate thread or make up your own. SAV file only featuring opening round playoff rosters. Keep in mind it is nearly impossible to have everyone entering the post-season with 100% stamina. 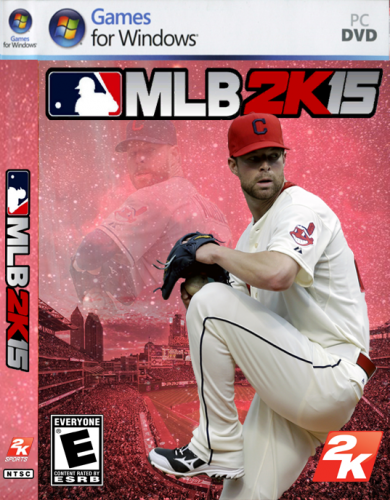 Also you will see relievers in a starters slot (because the game demands the 5 starter slots be filled). The file is saved to play as the Chicago Cubs. To change teams, use the tywiggins team changer app (found in the downloads section). End of 2016 season rosters. MLB focused only. There was no attention given to MiLB at all. Primarily rosters reflect amount of service given to a given organization, except for some particular players who need to remain at the MLB level. It is highly recommended to play with injuries, trades and suspensions set to OFF, otherwise your game/season may crash. If you believe another player should be on the MLB level, he's probably on one of the minor league squads. If you find a jersey number is wrong, this is easily changed via MVPedit or right in the .dat file itself. If you believe you've found a blatant omission, please PM me for a correction. PC vs PC roster set is forthcoming.